Fathers working for the side of evil seems to be a recurring theme in recent Precure. Of the last four Precure series, this is the third with a main character whose father is working for evil. 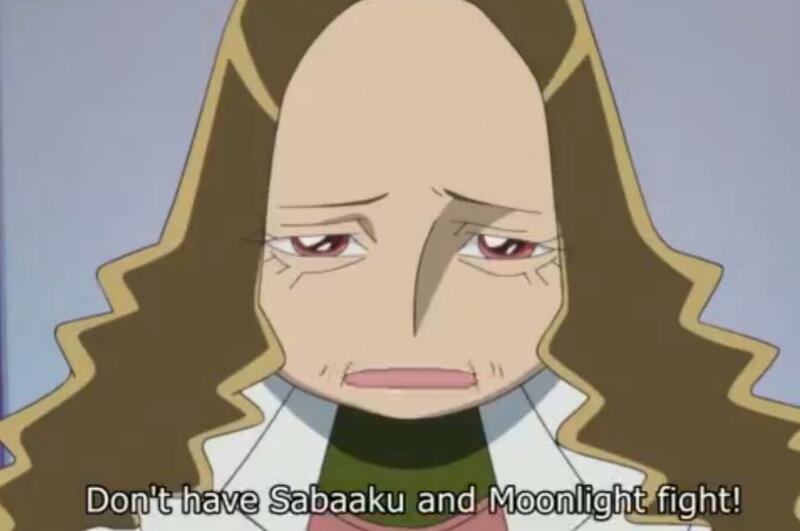 In Heartcatch Precure, near the end of the series, we find out that Professor Sabaaku (the apparent leader of the Desert Apostles) is the father of Yuri-san/Cure Moonlight. Throughout the series, we know that Yuri-san’s father, Professor Tsukikage, was missing. He was researching the Heart Tree, and he disappeared. Cure Flower tells the other girls to keep Cure Moonlight from fighting Professor Sabaaku. We then learn that Professor Sabaaku is Yuri-san’s father. Professor Tsukikage is redeemed by the Precures, and then he sacrifices himself in their defense. Cure Moonlight must come to terms with her feelings and her grief surrounding her father before she can become completely whole. In the next series, Suite Precure, we meet the mysterious Cure Muse. When we first meet Cure Muse, she is dressed in a dark costume. 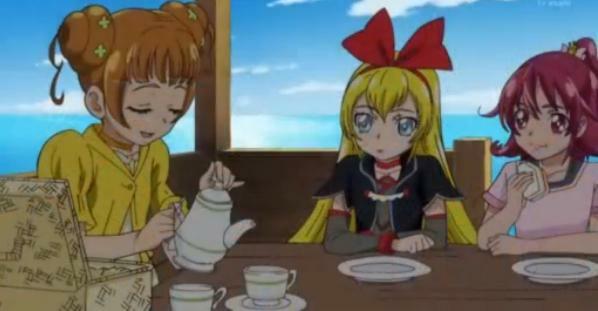 At times, she assists the other Precures, but she tells them repeatedly that she is not their ally. She further insists that she is not anyone’s ally. After she protects King Mephisto (the ruler of the Evil Minor Land) from the other Precures, we learn that she is the daughter of Queen Aphrodite (the ruler of the Good Major Land) and King Mephisto. King Mephisto used to be good, and when he turned to evil, she received her Precure powers. Caught in between the battle between her mother and her father, she helped the Precure at times, but she did not ally herself with them. She had to be taught that true loyalty to her father was helping him return to his former good self. In the last episode of DokiDoki, Regina-san was torn between loyalty to her father, King Selfish, and loyalty to her new found friends. One of the interesting things is that Mana-san did not even consider that Regina-san would fight her father, and she completely understood Regina-san’s love for and loyalty to her father. She also seemed to believe that Regina-san’s love and loyalty could transform King Selfish. In both Heartcatch Precure and Suite Precure, this indeed did happen. 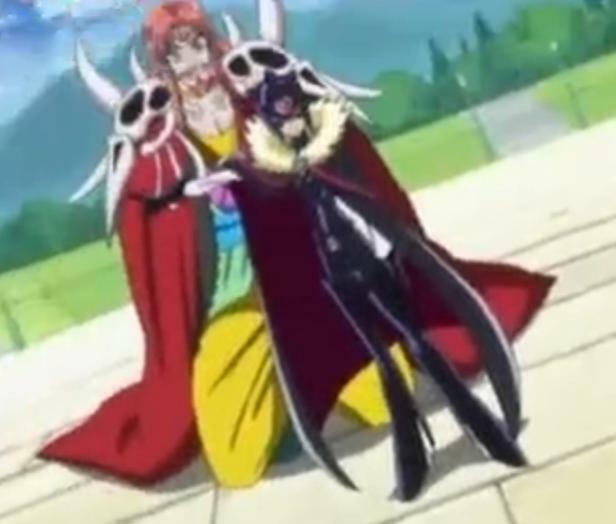 Cure Moonlight’s love redeemed Professor Sabaaku and Cure Muse’s love redeemed King Mephisto. Neither Professor Sabaaku nor King Mephisto were the ultimate Evil Boss. Instead, they were pawns of the true Evil Boss. In Heartcatch Precure, the ultimate Evil Boss was Dune, and in Suite Precure, it was Noise. So far, it seems that King Selfish is the ultimate Evil Boss. Of course, we may find out otherwise as the season progresses. Sadly, after the last episode, Regina-san did go back to her father and to the side of Evil. She did not become the new Precure. I am interested in seeing how this story progresses.